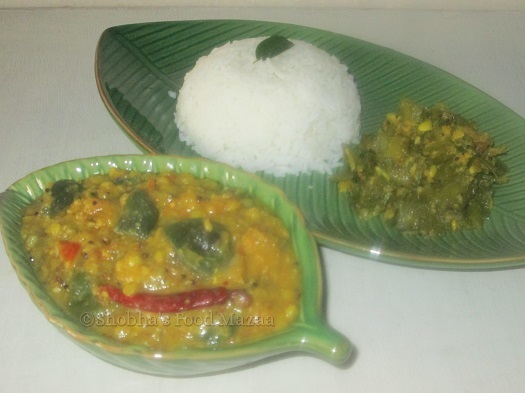 Dal is such a versatile dish that can be made with endless variations. This is a recipe from Andhra. Pappu means thick dal. This can be made plain or with the addition of any greens or vegetables to it. Today's recipe is with brinjals. Turmeric powder .... 1/4 th tsp. Tamarind juice ....... 2-3 tbsps. Ginger - garlic paste ... 1 tbsp. 1. Wash and soak toor dal for 2-3 hours. 2. Boil dal with 2 cups water, salt, turmeric powder and ginger garlic paste. 3. When it is half done add the tomatoes, green chillies, methi and coriander leaves and brinjal pieces. 4. When the brinjals are done stir in the tamarind juice finally and check the thickness of dal. Add water if needed and just mash lightly with the ladle. 5. Heat a little oil and add the tempering ingredients. 6. When they crackle stir them into the prepared dal. Serve with plain boiled rice and any poriyal. Pour a spoonful of desi ghee on the rice. I love brinjals so definitely going to try this recipe as I have never made this combination before. Thanks Nayna.. you will surely like it. I really like dal but don't make it enough! Love your leaf plates! 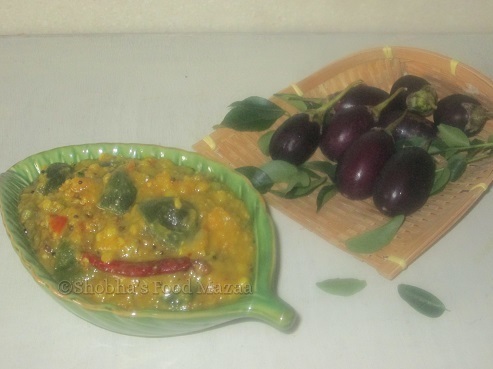 A good way to serve the dal, with brinjals. Healthy and filling. Thanks Mayuri.. In South India everyday different veggies are added to dal as it is the staple food there.